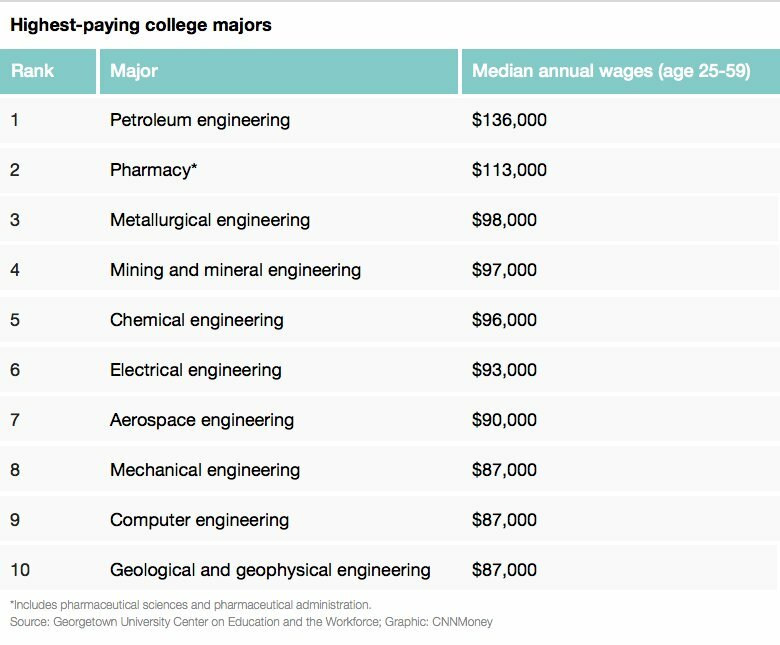 NEW YORK — Here’s a shocker: Nine out of the 10 highest-paying college majors are in engineering fields. The report, which used 2013 Census data, found that workers who graduated with this degree made a median annual salary of $136,000 each year. The report analyzed annual wages for 137 college majors. It found that after a year, the salary difference between the highest- and lowest-paying major is $97,000. Over the course of a lifetime, it’s a difference of $3.4 million. While engineering majors are the highest paid, business management and administration is the most common major, making up 8% of all college-educated workers. Business majors, combined with science, technology, engineering and math majors — the so-called STEM fields — account for 46% of all college graduates. And these days, you find fewer people majoring in something your grandfather would say won’t get you a job. The report said that four out of five college graduates majored in a career-focused field.